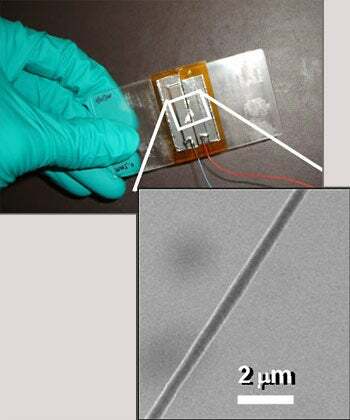 Scientists from University of California, Berkeley have developed fiber nanogenerators that could harness the energy of your everyday movements and convert it into an electrical charge. Does your smartphone need a midday charge? Just go out for a run! The nanofibers are made of polyvinylidene flouride (PDVF), which the researchers say is cheap and easy to manufacture. The fibers work under piezoelectric properties: They can create an electrical field from mechanical movements or stress. Theoretically, any motion you make--such as walking or kicking with your new pair of piezo-pants--will create some kind of electric charge. This isn't the first time researchers have devised ways that clothing could recharge your gadgets. Just last month, researchers from Stanford University (which happens to be Berkeley's arch-rival) announced that they developed textiles that can hold a charge. Ideally, if this blend of technology and fashion were to take off, we could start seeing smartphones and other gadgets equipped with the necessary adjustments to be charged though PDVF clothing. Berkeley's new technology is significantly more efficient than similar technologies devised in the past, so it might actually have a chance of reaching a consumer market. The day we're able to walk into American Apparel and buy a pair of Piezo Pants will be the day Geek Chic hits the big time. No word on whether we'll see them on the runways in Milan this year.